6 months ago the general public got its first taste of Welcome to: Our House when Funkmaster Flex played “Hammer Dance” on his radio show. 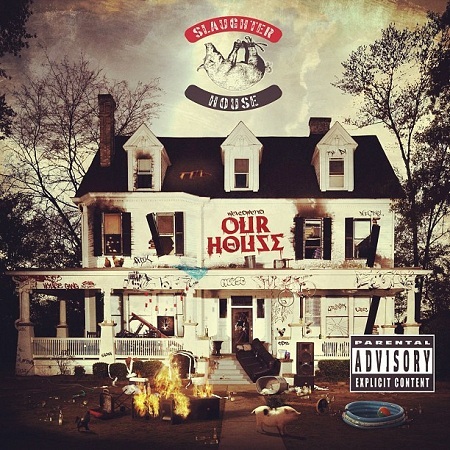 Featuring a sample from Korn’s “Falling Away from Me” and production work from AraabMuzik, this song was a surprising single from Slaughterhouse. Composed of Joe Budden, Royce da 5’9”, Joell Ortiz, and Crooked I, this group is a legitimate powerhouse in Hip-Hop. Each one of these MCs can hold their own and have a flow adaptable to almost any situation. Almost being the operative word. Eminem is brought on to Executive Produce the album, which ends up hurting more than it helps. Welcome to: Our World shines on tracks that are far from Eminem’s trademark sound, and that allow the other rappers to play off of one another. “Our House” embodies the issue perfectly. With a verse from Em and a hook from Skylar Grey, the song ends up being a bloated 6-minutes long because of 3 more verses from Slaughterhouse. The beat sounds like it was tailor-made for Recovery and is completely out of place. That being said, there are plenty of great moments on this album that wisely get as far from the Eminem aesthetic as possible. “Get Up” finds the group rapping over drums that clip aggressively, and a keyboard line that keeps the momentum going. No I.D.’s clever sampling of “Ali in the Jungle” by The Hours does wonders for all of Slaughterhouse, but Royce Da 5’9” absolutely demolishes his verse. Towards the end of the record is “Goodbye,” which finds Slaughterhouse being surprisingly poignant and emotional. A lot of rappers’ attempts at eulogizing their loved ones comes off heavy-handed, but this track does an incredible job of being honest while not being sappy. Ortiz’s verse stands out as it perfectly engulfs the listener in the whirlwind days before a funeral. After numerous delays and a huge amount of hype, it’d be easy to dismiss Welcome to: Our House, but the pure talent and natural charisma between the 4 members cannot be played down. That is, when they’re fifth wheel isn’t demanding his presence be known. Eminem, Royce Da 5?9? & Kon Artist go on Tim Westwood show and spit a freestyle over an Alchemist beat.